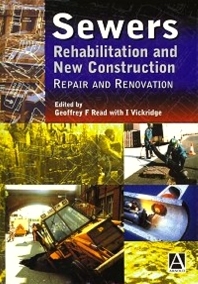 This, the first of two volumes, gives a comprehensive treatment of the civil engineering work relating to sewers and emphasises the practical aspects of repair and renovation. A considerable amount of theoretical work already exists on this subject. However this book is unique in meeting the engineer's need for up-to-date information on the application of theory and incorporates some important recent developments in the field. The technical aspects of survey and access are dealt with in some detail and the book also provides fundamental data on hydraulics, structural assessment and the use of the Wallingford Storm Sewer Package. Professional civil and structural engineers, municipal engineers. Also of interest to those involved with sewerage/wastewater engineering and public health. The development of public health engineering Development of the national sewerage network The problems of sewerage dereliction Planning Sewerage Rehabilitation and maintenance Sewer surveys Traffic management and public relations Access Hydraulic assessment Ancillary works - cleaning and overpumping Repair and renovation Localised repair techniques for non-man-entry sewers Structural aspects of sewer rehabilitation Assessment of renovation techniques and costs Storm water overflows Contract strategy Construction management Site supervision Sewer repair and renovation in Japan Development and Research.